Where is the orbitofrontal cortex? The orbitofrontal cortex is the area of the prefrontal cortex that sits just above the orbits (also known as the eye sockets). It is thus found at the very front of the brain, and has extensive connections with sensory areas as well as limbic system structures involved in emotion and memory. What is the orbitofrontal cortex and what does it do? The orbitofrontal cortex (OFC) is a poorly understood area of the brain, but also one that inspires a great deal of interest for some of the roles it is hypothesized to play in higher-order cognition like decision-making. Indeed, the prefrontal cortex and frontal lobes in general are considered essential for rational thought, reasoning, and even the full expression of personality. Thus, much of the research into the OFC has focused on functions that seem especially important to the thought processes that separate humans from other species with "lesser" cognitive abilities. We know very little for sure about the OFC, however, and the degree to which the functions ascribed to it below are truly regulated by the OFC is still being debated. Some of the functions commonly associated with the OFC--and indeed with prefrontal areas as a whole--involve impulse control and response inhibition. This hypothesized role for the frontal areas of the brain can be traced back to Phineas Gage, who allegedly experienced a drastic reduction in social inhibition after a railroad accident that caused extensive damage to his prefrontal and orbitofrontal cortices. Deficits in response inhibition have also been seen in human patients and non-human primates that have damage to the OFC. For example, in one experiment patients with OFC damage were rewarded by touching a particular image when it appeared on the screen of a video monitor, but taught to avoid touching a different image. Although they were able to learn to avoid one image initially, when the researchers reversed the value of the images (such that the once-rewarding image was now the one to avoid), participants with OFC damage had difficulty inhibiting their impulse to touch the previously-rewarding image. This may suggest that the OFC is concerned with a type of impulse control; however, others have argued that the OFC might only be involved in inhibiting impulses after this specific type of reversal procedure, as studies that have attempted to show a general deficit in response inhibition after OFC damage have not been consistent. The OFC is also frequently associated with certain types of decision-making. For example, it has been hypothesized that the OFC is important in decisions that must be made by comparing the relative value among several options to decide which is preferable. Patients with damage to the OFC have been found to display deficits in gambling tasks that require them to consider the usefulness of different gambling strategies to maximize the potential of earning fake money. A study in monkeys also found that neuronal firing patterns in the OFC changed depending on the value of a juice reward the monkeys were offered (e.g. some neurons were activated more in response to being offered a rewarding Kool-Aid drink than in response to water). Later research has suggested the OFC may have a more specific role than just value-based decision-making; it has been hypothesized the OFC may be necessary for making predictions about decisions based on newly-learned information. In other words, the OFC might not be needed to form a simple association between a stimulus and a reward, but may be necessary if something changes about the stimulus and an estimate must be made about its potential to still provide a reward. The OFC has also been implicated in playing a significant role in emotion. 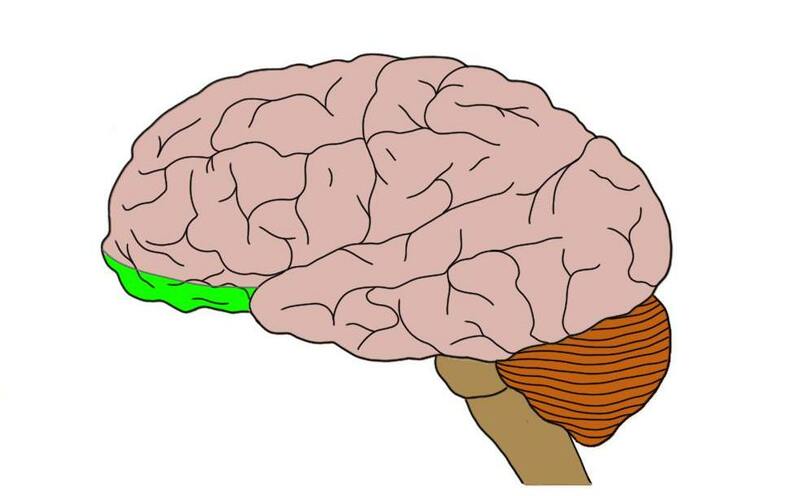 As mentioned above, the OFC is interconnected with limbic system structures like the amygdala, which are considered to be important to the experience of emotion. It has been hypothesized that the OFC is involved specifically in modulating bodily changes that are associated with emotion (e.g. a nervous feeling in the stomach and increased perspiration linked to anxiety). This hypothesis has been supported by experiments with patients who have OFC damage; in gambling tasks they tend to make risky choices and yet display no signs of anxiety as measured, for example, by skin conductance (which gauges perspiration). Healthy controls make fewer risky choices and when faced with the option of making a risky choice they display increased skin conductance, which suggests they are perspiring slightly. The patients with OFC damage can identify which choices are the most risky, yet they continue to make them. Researchers have suggested this is because the OFC is involved in providing an important bodily signal that helps individuals identify a poor choice by initiating an emotional response to it. Others have argued, however, that the deficits observed in gambling tasks with OFC-damaged patients represent a deficit that may not necessarily be emotionally-based or involve only emotionally-guided decisions. Indeed, patients with OFC damage don't seem to display a global emotional deficit, which might be expected if the OFC played a crucial role in regulating emotions. Thus, although the functions discussed above have all been associated with the OFC, there is still a great deal of uncertainty as to the extent they are controlled by the OFC; at this point there is no consensus on what the OFC does and does not do. It seems safe to say that the OFC plays an important role in cognition, but it will take further research to determine what exactly that role is.